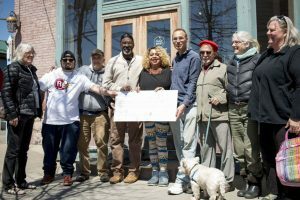 Redirecting war taxes to the Ultimate Reentry Opportunity in Ithaca, New York, in 2017. 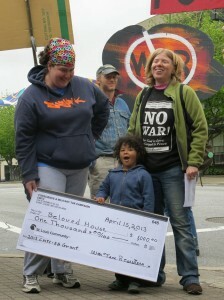 A war tax resister delivers a check at a redirection granting ceremony in Boston. 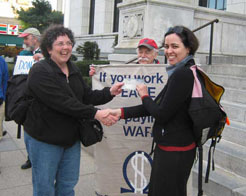 Many war tax resisters not only refuse to send their tax money to the U.S. government, they also redirect that money to programs in their own communities that are suffering from perverted government priorities, and to nongovernmental regional, national, and international groups seeking to create a better world. Jason Rawn made 1,000 stickers that read, “Defund Militerrori$m” and distributed them to people around the US and the world. NWTRCC collects information about redirection each year. While we don’t get a full picture of redirected tax dollars, because not all groups and individuals report their redirections, we think this is an inspiring “tip of the iceberg” look at how this money is being better used. The Conscience & Military Tax Campaign is one alternative fund that helps war tax resisters redirect their taxes. War tax resistance alternative funds began in the late 1960s as a way for resisters to pool the thousands of federal tax dollars resisted because of the Vietnam War. Hold resisted taxes in escrow until the government allows taxpayers to pay taxes without any of that money going to war (through, for example, the Peace Tax Fund Bill). Provide potential security of funds from seizure by the IRS. (Since all deposits are held in one common account under an organization’s name rather than an individual resister’s name. This isn’t a guarantee that the IRS will never be able to seize these funds, but it may be less likely). Allow participating resisters to withdraw their deposits if the government seizes money from a resister’s personal account. Offer interest-free loans and/or grants to community self-help, social change, peace, and human service programs, using deposits of resisted taxes and/or interest earned on those deposits. Give the resister a way to emphasize that they are not simply keeping the resisted taxes to profit from their resistance. For example, in 2016, the People’s Life Fund in Berkeley redirected $20,000 in interest and donated tax money to 16 community groups. Other alternative funds that make significant redirections each year include the People’s Life Fund in New York City, the Conscience and Military Tax Campaign, and New England War Tax Resistance. What if no alternative fund is running near you, or if you have a new idea for a fund? Check out our Guide to Starting an Alternative Fund. Please contact the funds directly to inquire about their structure, guidelines and policies. These funds help reimburse resisters when the IRS seizes money to pay interest and penalties for their resisted war taxes. Contributors, who do not have to be resisters themselves, share in reimbursing resisters.